APDS PM530 represents a new complex solution, designed for automatic collection of information about radiation exposure of the personnel. The Automated Personal Dosimetry System can be applied in the medical institutions, in industrial enterprises, at nuclear power plants, in radiological and isotope laboratories, in nuclear research centers and other institutions, where individual radiation control is essential. The System itself is based on web-cloud technology, that allows users to view data in a convenient and familiar form from any PC connected to the network, tablet or smartphone. Structured hierarchical data base with appropriate access restrictions (unit/department/organization) can be set by the administrator. Also, administrator is empowered to manage users (add, remove, and change), assign user/administrator rights and include users into a subunit of the organization. Due to web-cloud technology any of volume data can be stored in the system for an indefinitely long time. 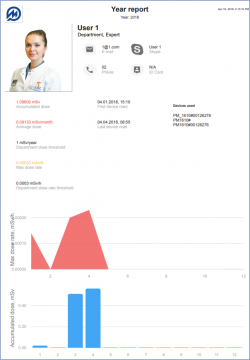 Radiation exposure reports are generated automatically and can be customized upon user’s request. APDS PM530 is compatible with Dosimeter Reader PM530-DC, which automatically read history from the dosimeter. Up to 500 readers and 10 000 of dosimeters can be integrated into the system. Reader PM530-DC is a component of Automated Personal Dosimetry System PM530. Dosimeter Reader PM530-DC can be connected to the corporate/departmental LAN via Ethernet or Wi-Fi and capable to carry out the fully automated reading of the dosimeter history and transfer the data to the data base server. Personal dosimeter PM1610 is intended for professionals exposed to radiation daily. This compact device provides measurement of the dose equivalent rate of continuous and pulsed X-ray and gamma radiation, as well as time of dose accumulation. PM1610 has audible, visual and vibro alarms to warn the user when preset dose/dose rate threshold levels are exceeded. The instrument is equipped with two detectors: highly sensitive CsI(Tl) scintillation detector and small-sized Geiger counter detector. Thus, two built-in detectors provide prompt gamma radiation detection and precise dose rate measurement. PM1703MO-1BT can exchange data with mobile devices via Bluetooth 4.0 wireless connection. The instrument has non-volatile memory, audible, visual and vibration alarms, shockproof hermetic case, compact size and light weight, user-friendly interface and doesn`t require special knowledge or training of personnel. Personal Dosimeter РМ1621 is equipped with a Geiger-counter detector and provides measurements of gamma and X-ray dose and dose rate at a wide energy range, as well as alerts the user via an audible alarm when the preset dose or dose rate thresholds are exceeded. Hermetic and shockproof case and fluorescent backlight on LCD screen allow operation in the harsh and unfavorable environments.